Let us fill your cupboards and expand your cooking horizons. We at Di Bruno Bros. spend lots of time hunting out new, unique products from all over the globe. We're almost bursting with intriguingly delicious goodies, and so we decided we should share them with our fellow pioneers on a monthly basis. 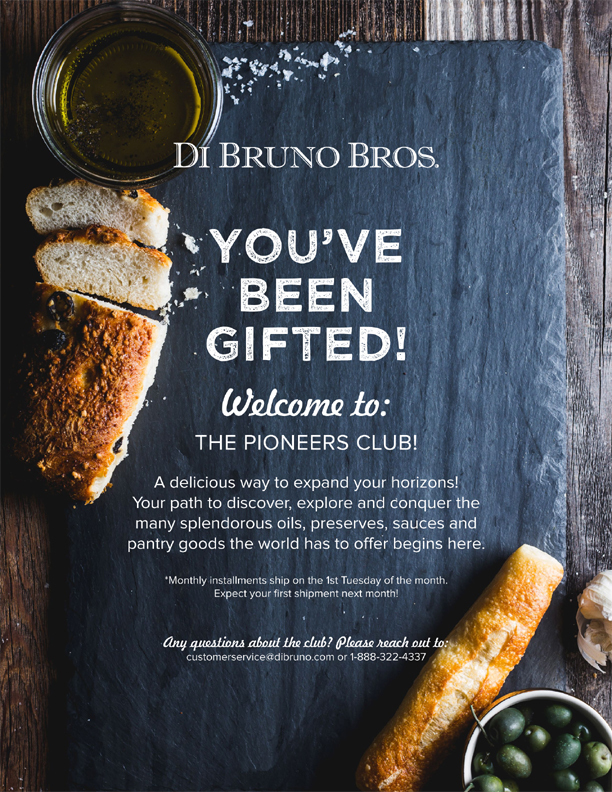 The Pioneers Club is your path to discover, explore and conquer the many splendorous oils, preserves, sauces and pantry goods the world has to offer. Pairings ship on the 1st week of the following month and shipping is included, so just kick back and wait for discovery to come your way! We will send the recipient a welcome letter that includes your gift message the same day we receive the order. Monthly selections will begin shipping to your recipient the following month. Each month, we’ll select a recipe, a theme, a category of products, or a favorite meal and send a bundle of goodness your way. We'll help you give your usual mostardas and oils the night off with some surprisingly approachable alternatives. Join the club and eat your way through everything Di Bruno Bros. has to offer like a true culinary pioneer. Download our Monthly Club welcome message below, then email it to your recipient!